Corn Dogs and Blue Ribbons is a portfolio of photographs that I took over a two-year period at fourteen summer fairs in New England ranging in size from small 4H fairs to giant ‘expos’. Passing through the gates of the first fair since I was a teen, I found myself smitten again. I was surprised and delighted by the open and generous sharing of information from all ages of the 4H community. The deep connection with their animals was particularly intriguing and enviable to me. I found that fairs are still a complicated balance of startling innocence and huckster sleaze. Everything is for sale; from whirlpool baths to religious salvation. All of these disparate elements exist in harmony against a backdrop of gleeful screams, bells and whistles and the aroma of fried dough mixed with the pungent essence of livestock and exotic poultry. This portfolio presents an emotional and somewhat wistful visual record of this long-standing American tradition. I chose to photograph in black and white using extremely basic plastic toy cameras because I purposely wanted to lose sharp detail and instead capture a fleeting moment, a broad stroke, the distillation of the experience in the hope of capturing an iconic image. 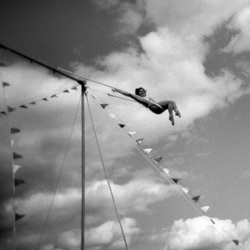 The fairs have changed so little over the last century I felt that using toy cameras and black and white film were a good match for capturing these timeless activities and that these tools work well at going beyond documentation but to instead illustrate the memory, the then-or-now of it. Will organizations like the Future Farmers of America and 4H continue to educate, nourish and interest tomorrow’s students in an agricultural career? Will the future of these summer fairs rely on a continuing shift away from agriculture to entertainment…. mostly food, specifically fried food; fried Oreo cookies, fried cheesecake “We’ll fry anything” one sign read.